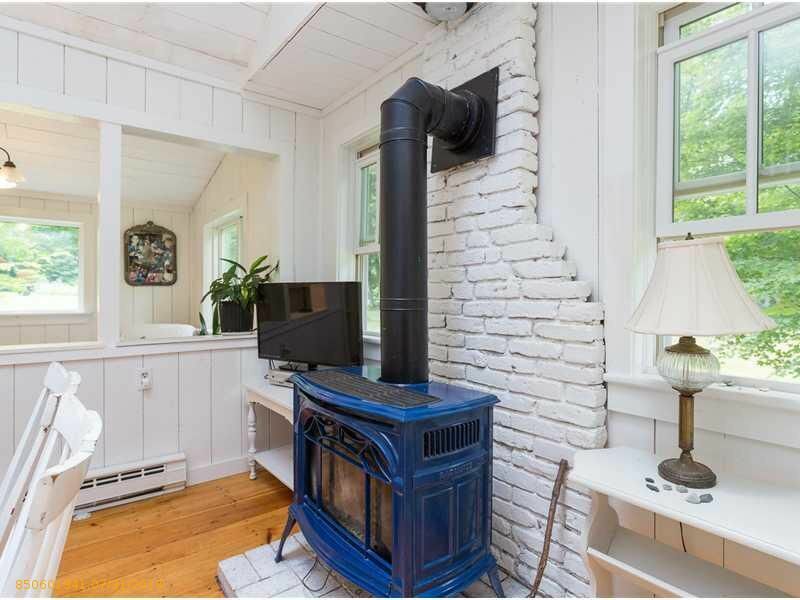 Relax in our private, romantic Cape Neddick cottage, overlooking a two-acre meadow and woodland, and comfortably close—by foot, bike, or car—to the amenities of York, Ogunquit, Kittery, and Portsmouth. Though close to amenities, this cottage is off the beaten path on a quiet private way, near the Cape Neddick River. It offers great natural light, lovely views of the surrounding landscape... and abundant tranquility. An open Dining area forms the cottage’s center. Its white vaulted wood ceiling and walls give the adjacent open-concept Kitchen and Living spaces an airy, relaxed feel. A gas fireplace-stove warms you up on the occasional chilly evening. A four-person Italian flip top dining table with comfortable chairs opens to accommodate eight persons when needed. The Living Room has a comfy leather sofa and flat screen TV. The Kitchen is fully furnished with stove/oven, microwave, and all necessary cooking and serving ware. The Deck, overlooking the meadow and woodland, has a dining table with chairs with umbrella. Two Bedrooms and a small Loft provide among them a king, a queen, and a double bed (all comfortable), and privacy, along with linen and towels. Amenities nearby include beaches, kayaking, paddle boarding, canoeing, boating and sailing, whale-watching and fishing, hiking and nature centers, as well as historic and cultural activities including live music and theater. There is a rich assortment of farm-and-sea-to-table dining, both fine and casual. For a more detailed list of what you will find nearby, see, York Maine. Our cottage provides you with comfort, quiet, and closeness to a rich slice of Southern Maine. My wife and I are architects, reside in Cambridge, Massachusetts, and purchased our cottage in the late summer of 2014. We have vacationed in the York area for years and found ourselves spending more time in Southern Maine. We chose our cottage in part because its location is convenient, but also because its park-like two-acre site gives us privacy and quiet in a genuinely beautiful location. We love having beaches so close, and the fact that after years of exploring, we continue to discover more here in Southern Maine. We hope you decide to vacation with us and find our cottage as charming as we do! Beautiful cozy cottage on huge piece of land . Beautiful secluded quaint cottage located close to many beaches. Super comfy beds, and cozy fireplace on cool September nights.well equipped, and quiet area ! Great for dogs they had a blast in the ocean. Thanks so much would definitely return. James was great! Cottage was in a beautiful location! We loved the cottage. The yard was beautiful! So quiet, we slept like babies. It was a great launching pad for day trips to other parts of Maine. We highly recommend it to folks looking to explore Maine and would love to visit again. Rustic comfort, quiet, and convenience. Return to the solitude and beauty of the Maine woods after a fun-filled day at the beaches, shops, and restaurants of York. The town is just a three-minute drive from the cottage. The comfy cottage has a fully equipped kitchen and convenient washer and dryer. Gorgeous views from the deck. We loved our stay. Sweet cottage! We loved our homebase in York! James’ home was clean, bright & very comfortable! We cooked-in several nights & felt right at home. The back yard is great. Dog-friendly & centrally located to beaches, shopping and all the attractions around the southern ME coast. Very relaxing! So glad we booked. My husband, our two dogs and I had a wonderful week long stay in this beautiful cottage. Although it is close to many of the area's attractions, it is tucked away on a quiet street. Our dogs loved playing in the spacious back yard, and we loved the peace and privacy. The cottage was clean and bright on our arrival. It was great to return to it from the beaches at Cape Neddick, Ogunquit and York. On rainy days it was just as relaxing to watch a thunderstorm and read. The owner, James, is very helpful, quick to respond and ensures the quality of your stay. We hope to return to this perfect retreat. We are conveniently located (within 5 miles) of five incredible beaches. The town of York has a wildlife zoo and amusement park. The Ogunquit Theatere is about 2 miles away. Both casual and upscale restaurants everywhere. Pictures include furniture that has been replaced by new furniture.